Because of the nature of its products and services, we found that prospects often prefer to talk to the Jordi team on the phone rather than to submit an online form. We started using call tracking services to measure which sources generated the most, and the best, leads. In 2017, we integrated the Infusionsoft marketing automation platform with JordiLabs.com. 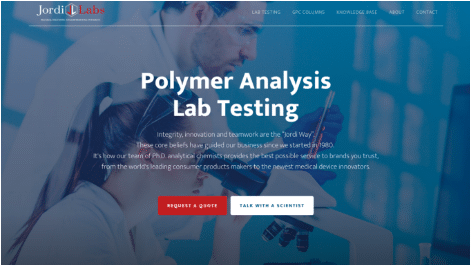 This is greatly expanding Jordi Labs’ ability to maintain a leading position with its long-term clients as well as with new prospects. We then created a strategy of using thought leadership to showcase Jordi Labs’ scientific advantages. Understanding how people perceive and interact with Jordi Labs has been one of our biggest challenges. In 2014, the company agreed to reimagine its 30-year-old logo. Our branding work for Jordi Labs extended far beyond the Web. In 2015, we were enlisted to redesign the company’s front lobby. The firm created a PowerPoint of concepts, which we refined and turned into a series of posters. In 2016, we produced this animation to show people in an entertaining way how Jordi Labs helps its sophisticated customers. Advertising on Google AdWords has been a key way to attract new customers to Jordi Labs. We have targeted key types of testing that Jordi specializes in, terms such as “gel permeation chromatography” and “mass spectroscopy”. Let’s write some concise copy for these sections and find concrete visuals of work we’ve done for them. Tools such as Infusionsoft marketing automation, call tracking and online advertising on a variety of channels produces more data than anyone can humanly process. We set up real-time online dashboards using a service called Raven Tools. Here’s an example of the kinds of data Jordi Labs and our internal team can access at any time.